Debuting in the special Superhero Year tie-in film, Kamen Rider 1, the original Kamen Rider himself received his first new form in over 40 years! This form has yet to be explained or expanded upon since it's debut, and frankly time will tell if it ever will be. Despite Takeshi Hongo's numerous appearances in movies in recent years, and in fact the physical appearances of his original actor Hiroshi Fujioka in even more recent films, this is the first we've seen or heard of the so-called "Powered Up" Rider 1. A bulky behemoth that packs a real punch, today we're studying this unique upgrade in toy form with S.H. Figuarts Movie Kamen Rider 1 ! Unsurprisingly the packaging for this figure is the same Drive/Ghost style slim black box we've become accustom to. Without much flourish to packaging with the recent rider lines, it's all starting to a look a little too similar. I'm sure Ex-Aid will mix things up, especially given how it's inaugural S.H. Figuarts release will be a 3-pack. 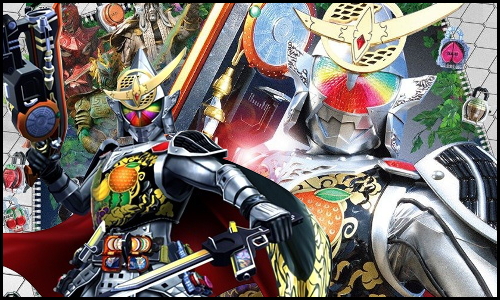 But given the fact that this is THE original Kamen Rider we're talking about, from his own movie no less, I expected something a bit more extravagant and impressive. Wow. Color me impressed. When this form was initially revealed in magazine scans and movie trailers, it was derided by many (myself included) for being too big & bulky. Just too muscular, and well, thick. But the added bulk of this form makes a lot of sense given real world and fictional concerns, the aging of actor Fujioka and in fact of the Hongo character himself. But you'd be forgiven for expecting this figure to be limited. While undoubtedly CG movie magic and other special effects gave the physical suit a special flare & abilities all it's own, it's definitely not an entirely functional design. But I'm happy to report that the figuart IS! This isn't going to be the most poseable figuart you've ever purchased, but damn it all it's still a nice one. Movie Kamen Rider 1 is an entirely new sculpt from the ground up. This body isn't shared with any other release, though I can see aesthetic influences from another Showa turned Heisei redesign, Kamen Rider 3. But again, all new parts. The legs themselves have a fantastic mostly full range of motion, the usual necessary ankle tilts, a knee that could stand improvement but isn't detrimental, and hips that while good aren't perfect. You may be worried about the small hip armor components on the sides getting in the way but thankfully they can both angle up very very well, so the hips have plenty of clearance there. Sadly there are some pointy protrusions on the upper edge of the hips that can easily snag on the waist armor and in fact can flake or break quite easily. So watch out for those. Moving up to the new Typhoon belt, Rider 1 has gotten a significant upgrade here. When not in use this new style Typhoon has a shield that covers it with the traditional Tachibana Racing Club logo on the front. By default the belt is split open but the two halves can be removed and pegged in closer together to replicate this. Fun fact, I shot half of this gallery with the shield closed, and had to re-do all of it :P It's a welcome & unexpected feature though. The belt is also floating pretty freely around the waist and has some room to move up or down in case the hip armor needs a little more clearance or the abs do. The sculpted in ab section by the way is fantastic. Again this is where the figure tricks you with it's bulk, you expect it to be limited, but the upper torso joint floats perfectly on top. Allowing Rider 1 to arch his lower torso back and upper forward to give him really dynamic body language. I'm just impressed all around here. Even in the arms I expected severe limitation and found them to be really superb. More than most figuarts this one can actually accomplish it's signature poses! The traditional arm across the chest pose is nothing for this figure. Thanks in large part to how well the shoulders can come out from the main body, and how those massive shoulder pads (which are 2 pieces) can move independently to angle out of the the way. Perhaps my only complaint with the arms is that the wrist ball joints seem larger than the peg holes in the fists themselves, making it a little difficult to swap hands. Finally we come to the head, which to me is the one thing about this figure that departs the least from the original design(s). Well that and the classic muffler. The head definitely has more of a military style hardware look to it with the low edge covering the back of the neck. It feels more like armor and less like decoration you know? The eyes are a gorgeous red that's similar to what's used on Gold Drive so they really pop in the right lighting. But all in all this figure is fantastic. The sculpt & paint apps are on point, and the articulation is there. I totally get someone disliking this design, but once you have it in hand I don't know how you couldn't love it. It's just a top notch figure. Minor issues aside Movie Rider 1 really is just a great release. 2- sets of additional hands. I'd hoped for more, like possibly bike riding hands. I know the new Movie Cyclone has never received a release date but Rider 1 works very well with most previous releases of the Cyclone as well. So those hands would have been great and cheap to produce inclusions. 1 - muffler/scarf. The ball on the neck is a bit too large to plug this on easily but once you get it on there it rotates very easily. I'm surprised a wind-swept version wasn't included like with previous Rider 1's. 1 - Rider Kick Effect part. An always welcome addition that often is left out from most non-Showa rider releases. I especially like the coloration on this one. It's got a little more uniqueness to it than most kick effects. And thankfully it locks onto the foot much more tightly than many I've dealt with previously. A pretty lite selection but mostly appropriate. There were no other items used by Hongo in the move, and his motorcycle is still out there somewhere in prototype limbo, but I still think he needed more hands. The two sets of open hands work well but I wouldn't have minded some "holding things" hands as well. "Riders will always be by your side." Last edited by Den-O; 01-04-2017 at 01:00 PM..
Last edited by Den-O; 12-03-2016 at 11:40 AM.. It's definitely a design that took a while to grow on me and I kinda like that they slimmed it down a bit for the figuarts release. Still one I have to get myself. I really like this form! I loved the movie and wish they use this version of Ichigo in future teamups, but they probably won't. Love that photo with him and the Takeshi figure, nice effect! Anyways, thanks for the pictures, love the anthology shot of the Rider 1 figures, I can’t wait to see Shinkocchou Seihou Ichigo added to the legacy. I was already a fan of the new look for Ichigo. But then I saw they slimming it down for the Figuarts release and that was what made this a must have for me. I don't actually own it yet, money issues and all. But this is definitely one of the ones that spoke to me as soon as I saw the first images. I was, personally, never a fan of this design. I would have rather preferred a modernized, slim down version ala KR: The First and maybe that power be passed down to another cyborg or something. I like the figures articulation, just not a fan of the concept. Nice job with this gallery. The figures as always look great. Like the look of it but its sad that its not as bulky as the suit. Kinda bummed that the figure isn't quite as bulky as the suit used in the actual movie, but I still love the design, and I am really looking forward to getting this guy.